What exactly is website visitor tracking? This broad term covers many types of tools from visitor identification to heat maps. All of these tools can complement the traditional methods of tracking website visitors via Google Analytics. By tracking the users that are visiting your website, you can make smarter marketing decisions based on the unique patterns and pages they view. This both helps build out a more refined buyer persona from your target audience, and can dramatically improve your website’s conversion rate. An awesome lead-generation website can do a lot of the heavy lifting for you and can be a powerful way to fill your sales pipeline with qualified B2B prospects. The problem is, even if your website’s conversion rate is crushing the industry standard, you may be missing out on some key prospects that come and go without contacting you. 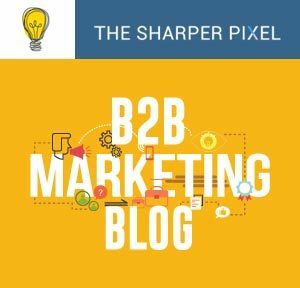 A solid inbound marketing strategy is a tremendous way to earn qualified B2B leads, but even the most engaging website is leaking potential leads that move on to your competitor. In this post, I’ll tell you how a website visitor tracking software can help recover some of those missed opportunities by allowing you to follow up with high-value visitors that you have identified as a hot prospect. Welcome to the sneaky and lucrative world of website visitor tracking software. Website analytics is big business because it’s an incredibly powerful way to leverage machine learning to automate your marketing and sales strategy. They tell you how well your website is performing, and provide useful insight into your ongoing inbound marketing effects. The quality of the leads you earn relies heavily on the quality of the information on your website. But if you’ve created highly-actionable content about your product, prospects will take notice. However, if you don’t have the proper lead generation measures in place, you won’t capture as many B2B leads as you should. These are the absolute basics of a profitable lead generation website. For a summary of these tips and a few more ideas, check out this blog post from Marketo. Of course, none of these strategies will work well if the content on your website lacks authenticity, value and accurate information. Today’s business buyers are educated and can spot an uninspired sales page when they see one. As the SEO guru Neil Patel says, “your leads are only as good as the website that produces them”. What is your websites conversion rate? These inbound marketing strategies can work extremely well, but your website may still be “leaking” valuable B2B leads. To complete the cycle of this strategy, the user must convert by filling out a contact form on their own. If your website has done a great job of convincing visitors to take action, you can expect to convert about 2% of the traffic that visits your site. If your conversion rate is less than 2% of your overall traffic, there are some things you can do to improve this metric. Include a form on every page, above the fold. Adding a non-overly aggressive visual cue such as an arrow or noticeable color scheme can help. You should also include a contact number, whether you prefer to take calls about your products or not. Having a real phone number on the website adds credibility and authenticity to your business. Include testimonials and social proof on the important pages of your site. The product and pricing pages of your website should have social proof from your satisfied customers to help prospects understand the value you’ll bring them. Now that you’ve managed to improve the conversion rate of your inbound traffic, it’s time to look at the visitors that didn’t fill out a form. To offset the visitors that don’t convert, website visitor tracking software can be an excellent way fill in the gaps by utilizing outbound marketing tactics. The many software services available for this marketing strategy uncover the company details from each unique IP address on your site. Naturally, not all of the IP’s will be “decoded” but achieving an identification rate of 25% or more should is considered excellent. This form of website visitor tracking relates to heatmap technology and is useful for improving the user experience and conversion rate on your website. The term “website visitor tracking” can cover a broad variety of digital tools, but the ones we’ll focus on track IP addresses to give you specific company details for the purpose of lead generation. Hotjar is certainly a website visitor tracker – but the information it provides is more useful for conversion rate optimization rather than lead gen. The software will first analyze the website traffic and identify the IP addresses associate with each page view. A useful website visitor identification software should make it clear which company the visitor is from, and the industry they are in. Some visitor identification tools even provide specific details such as their job title and annual company revenue. That’s some seriously powerful lead intelligence to have when reaching out to cold prospects. How you choose to reach out to cold prospects without creeping them out, is up to you! Without tracking these visitors to your website, you may be letting hundreds or even thousands of warm B2B leads slide through your fingertips. I don’t know about you, but I’d always rather have the option to reach out to these contacts, especially if they buyer persona is a perfect fit. Imagine being able to identify potential leads on your website that are researching your product. By having a window into the buyer journey at this stage, you not only better understand your target customer, but can reach out to the ones who are a perfect fit for sales. Look for software that includes advanced lead intelligence features such as lead scoring, email alerts and notifications and lead assignment and distribution. This offers a better way to introduce the platform to your existing tech stack, so sales teams can seamlessly incorporate the data into their CRM. A visitor tracking tool could be a great addition to your lead generation strategy, especially if your website currently receives a lot of traffic. Even if your sales team doesn’t reach out to individual prospects to close, the insights gained throughout the process can have a profound impact on your marketing efforts. The following list of visitor tracking and identification software options are paid subscriptions for large B2B businesses with plenty of traffic. Consider about 5,000 unique page views to be the threshold for these tools to provide a healthy ROI. 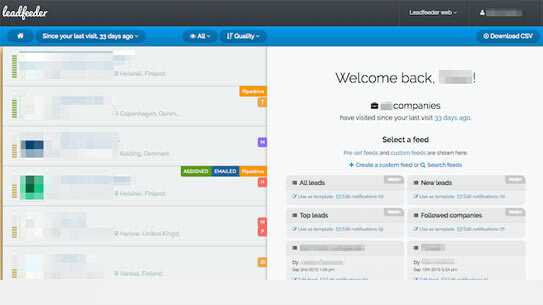 Leadfeeder specializes in turning website visitors into sales leads. It connects to your existing Google Analytics account and integrates with popular CRM’s and marketing automation tools. Salesforce and Pipedrive users will be happy to know that Leadfeeder connects seamlessly with these powerhouse CRM’s. Heck, Leadfeeder even connects with LinkedIn so you can start a conversation with a prospect based on their previous actions on your site. This level of behavioral intelligence can really provide an advantage when reaching out to potential customers. Among Sharpspring’s many tools is a visitor ID feature. It allows you to identify anonymous visitors by using a reverse IP lookup. Sharpspring includes much more than a website tracking tool including email automation and dynamic forms. Check out the comparison guide between Sharpspring and its competitors. 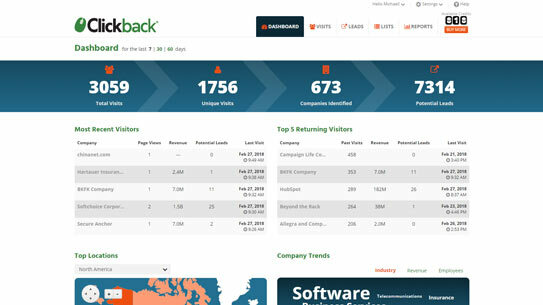 Clickback WEB gives marketing and sales teams the information they need to reach out to B2B leads quickly. 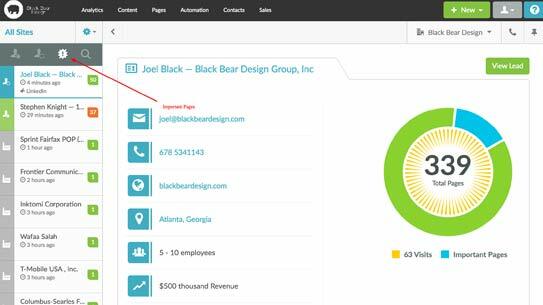 The email notification feature allows sales teams to receive daily alerts when a current prospect revisits your website. They offer a 14-day free trial of their software. To turbocharge your lead generation efforts, consider combining the lead intelligence capabilities of a robust website tracking software with an effective email marketing campaign. Today’s B2B marketer must stay on top of the software tools at hand to keep up with the competition. 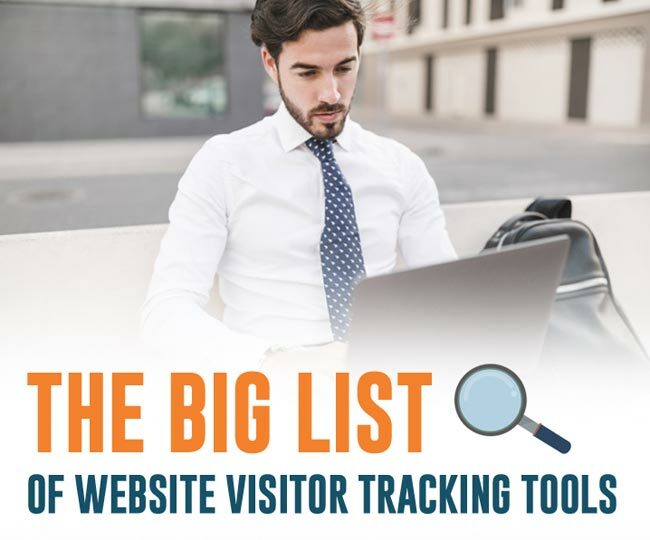 The following list of website visitor tracking software tools includes everything from visitor identification to heat maps and visitor recordings (and even smart live chat). These tools can provide a useful way to generate new B2B leads by identifying and monitoring anonymous web traffic. These website visitor tracking tools are in no particular order. For reviews of many of the following software tools, have a look at: The Best Visitor Identification Software (G2 Crowd). Did we miss one? Let us know in the comments! If you’re not in the business-to-business space, or your company isn’t ready to invest in a dedicated website tracking software, consider a free tool such as good ‘ol Google Analytics. The real-time overview is great for observing which pages your site are being viewed, and from where. Until next time, keep generatin’ those leads.